It is really cold here today so of course I had to make a snowflake project. LOL Over at The Greeting Farm they are having a TAG challenge so I thought this would be a great project to make. Wow this Blue is just "GORGEOUS"... I love the designs and Ian is soo cute.. Thank you for playing along with us this month for our Retro Fresh Challenge. Dawn - your tag is AMAZING!!!! What fab work, love background and sweet image! Thank you for sharing your lovely work with us at Deep Ocean, hugs, Franz. ps: i have a Christmas Candy if you like. What a great tag, and yes, very chilly. Love the image and all the blue! Sensational colouring!!!!! Love this tag! Thankyou so much for sharing your project with us at Creative Craft Challenges. 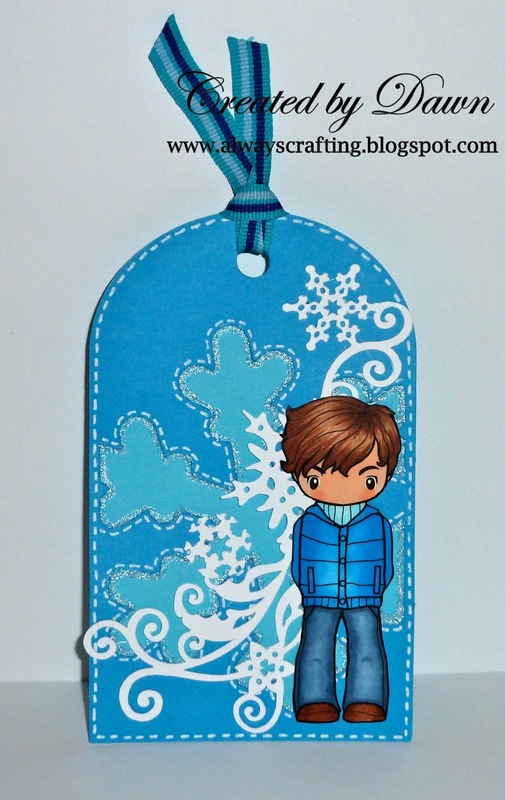 Lovely tag and beautiful colouring. 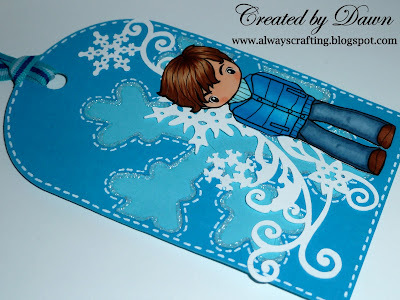 what a fun, bright and cheery tag! lovin all the blue ~ and what an adorable colored image! Love the darling Ian with the snowflake and swirl...just prescious! Thanks for joining us at TGF's Farm Fresh Challenge blog! Great tag! Thank you for joining Die Cuttin' Divas this week for our Tags, Tags, and More Tags challenge. wonderful tag !! thank you for joining EAC this week. Love the snowflake flourish! Beautiful blue tag! Thanks for joining us at SOS! Love this tag. Love the blues.